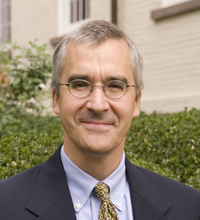 John R. Bowlin is the Robert L. Stuart Professor of Philosophy and Christian Ethics at Princeton Theological Seminary. He earned his MDiv from Union Theological Seminary in the City of New York, and his MA and PhD from Princeton University. He is a member of the American Academy of Religion, the Society of Christian Ethics, and the Society for Values in Higher Education, and has served on the editorial board of the Journal of Religious Ethics since 2003. His areas of specialization are Christian ethics, moral philosophy, social ethics and criticism, and the history of moral theology, and his courses cover ethics and the problem of evil, ethics and politics in Augustine, war and Christian conscience, and friendship, love, and justice. He is a member of the Presbyterian Church (USA).